The triploder takes the so often reported silky laminar feeling people get from the Imploder shower, and does it in triplicate. More TRIPLODER INFO and INSTRUCTIONS> - TRIPLODER APPLICATION NOTES . We particularly invite you to compare this unit with: Structured Water Unit Ours has 3 vortex just like theirs, but our vortex are more hydrodynamically accurate to the physics of implosive collapse; plus our unit is cheaper. These kinds of units are for example used in ice rinks where they need the water to crystallize in a more uniform geometry. With Animals:replicated tests in France show TRIPLODER distributes things like Homeopathic remedies with charge in the water, and did reduce/eliminate need for antibiotics/vaccines- with pigs and other animals. Note VORTICITY is central to BIODYNAMIC technique! 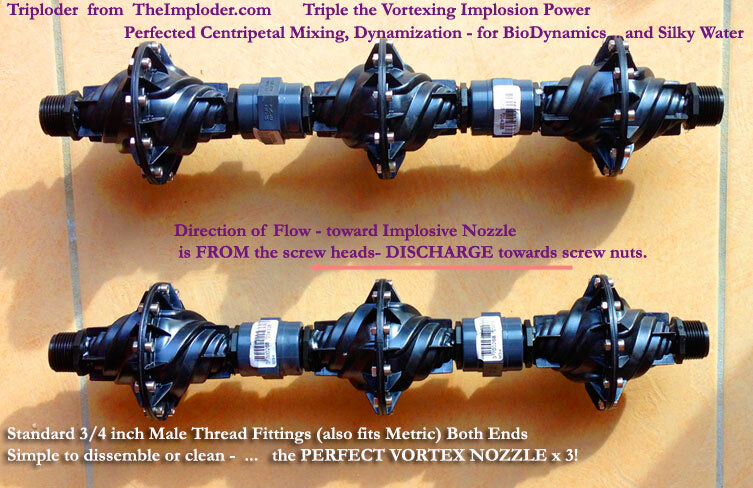 There are numerous testimonials for what simple vortex motion does to water - the Triploder, is literally THE PERFECTED precise vortex implosion geometry... TIMES THREE! The TriPloder design nozzle produces powerful centripetal self-organizing forces. This appears as a touchable 'pony tail' effect, making water silkier and more energized. This vortex action creates the tendency to discard any molecules that are not part of the perfect geometry of pure water. Tests have shown that it reduces chlorine and other impurities. Try the TriPloder for the best "spin" available! At The Imploder we believe our vortex nozzle design is the best of the Implosion Water vortex treatment nozzles. We have set up our proprietary precise implosion vortex nozzles in a triple array called the TriPloder which we believe should give all the benefits of this structured water concept. The silky effect of spun water optimized. In the NEAR FUTURE, Every farm, dwelling and community will have THE IMPLODER water treatment device installed. Improves vitality of grass, digestion and assimilation. Increases milk production and quality of meat. Creates healthier eggs and laying performance. Farmers can get significant increases in milk production. Feed The Imploder water directly to milking animals, because the solubility increase makes it easier to suspend the nutrients and butterfat in solution. It makes sense the animal can produce more milk with less biological effort. Improves vitality of the compost, helps microbes to be activated. Increases the breakdown of compost /manure and the binding of nitrogen. Because it increases sedimentation rate it will make sewage treatment more effective and quicker. The separation of water from waste material filtration happens faster e.g. waste management from farms e.g. “run-offs”. Creates more nutritionally rich dense foods. Subtle forces in products such as homeopathic and “Super Foods” will be stronger. Hydrates the body deeply therefore has anti-aging effects. We have conducted tests where we ran imploder water for a while every day and noticed the water felt 'silkier' and it was easier to move and swim through it. Also magnetic water treatments commonly see reduction in scale on pipes and certain fungi and algae growth. Since our device is probably the most powerful (in terms of gauss densities alone- not to mention the corrected centripetal spin to absorb that spin densely-from the nozzle) - it is highly likely that we will see even more potent effects on pool and pond waters. Creates ice and snow quicker, which means you will use less energy, saving much $$$. Because welting flowers can be re-vitalized. Flowers/plants watered with Imploded water will LAST LONGER, saving on wastage. Because imploder water feels silkier, and has more 'life force' and 'healing properties'. Because of water de clustering, it hydrates the body better. It helps to 'alkalize' the body. Note: it does not 'filter the water' of impurities such as chlorine etc. That would need to be done first with a RO filter. However, we are testing to confirm The Imploder increases the rate at which both solids and gaseous pollutants are segregated, sedimented and evaporated. With The imploded drinking water, people are consistently saying that it tastes 'silkier' and they are able to tell the difference every time. This is probably because of the decreased molecular cluster size and related solubility increase. People have reported various health benefits (one Canadian user swears it helped his back problem). Obviously we cannot claim health benefits until much more testing is done. It is up to the individual to experiment. Even things like returning hair color from grey, which have been reported with various water treatments, makes sense, because increased solubility means more mineral in hair and bones. There could be also benefits for arthritis sufferers. Keeps your plants strong and healthy. Place into a water atomizer stray, to refresh yourself. altho primarily designed for water - agriculture- and drinking- based on solubility increase- the materials of the Imploder CAN handle even mildly corrosive materials ( the liquid touches only superforton and tough PVC). The Imploder pieces are made from Super Fortron Plastic - So strong it replaces metal! Hi Strength Black FORTRON Nozzles - (full pressure rated- up to 50-60psi or more).